P. Anne Winter writes about our only Japanese mall. I recently had the pleasure of introducing Ruth to J-Town. We had such fun. Even if you can’t afford its goodies, it’s worth a trip just to see the many Japanese sweets, pastries, cosmetics, magazines, and groceries. You have to look hard to spot the small “J-Town” sign at 3160 Steeles Avenue East near Victoria Park Avenue. This mall was developed at the beginning of the 1990’s and still houses two of the early retailers, the Heisei grocery store and the Nakamura Bakery. The Japanese sweets in the bakery are tasty. Very delicate and colourful, they make this place look more like a French patisserie. The most tasty for me are the cakes with green tea mousse in the middle. There are around 16 shops and lunch spots. Heisei has a large stock of imported items such as high-grade Japanese rice. 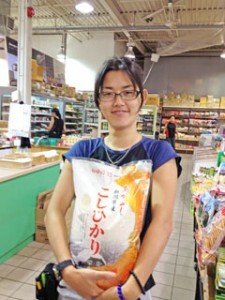 I have purchased their tofu, vegetables and sauces for years and enjoyed their wonderful bento or packaged lunch boxes. They are not like the usual commercial boxes found mass-produced and sold in many Toronto grocery stores. These delicacies are hand made. They are filled with marinaded squash, watery tofu, delicate lily stems, and yummy umabochi plums. 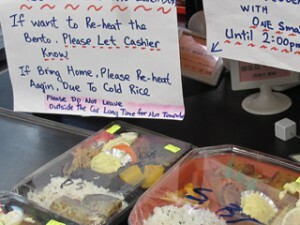 I actually had to wait a couple of minutes as a clerk retrieved freshly-cooked hot rice from the kitchen. The north section of the mall is mainly devoted to food. The sales staff is very helpful showing folks how to cook certain specialties. You needn’t feel awkward about trying something new. 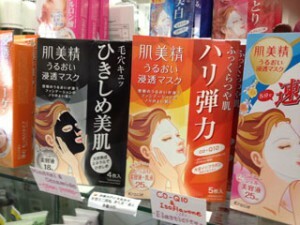 Face masks Japanese style. Copyright ©2012 P. Anne Winter. The oldest fish shop Tora has ready-made fine-grade sushi for sale. Newer fish stores here have fish freshly-flown in from Japan. I find the sushi very tasty and quite different from what one often finds in regular sushi restaurants. These fish stores have marvellous take-home fresh fish you can use for yosenabe or one pot cooking. The uni is part of the sea urchin, a favourite delicacy. It is reasonably priced here and usually prohibitively expensive in restaurants. Miki Park, daughter of the variety store owner, displays soba bowl and fan. Copyright ©2012 P. Anne Winter. Beside the meat section is a variety nick nack shop. The Parks who own this store are from Japan but originally from Korea. I am always amazed at their very low prices; for instance, a delightfully-decorated soba noodle bowl was only $12.00. The fans are much less. Very sharp steel knives for meat and fish were around $45 but for cutting vegetables, some were as low as $3.50. You can get golf balls, umbrellas, yukatas, zori (sandals), and key chains. You can find specially-designed decorative containers for shoyu (soy sauce) made for bento boxes. One small wooden chopping board was $3.50. The south side of the mini mall has a different atmosphere. The labels on the beauty products, medical aids, and DVD’s there are all in Japanese. Ai is a quality women’s clothing store. Unfortunately for me, it only seems to cater to petite Asian figures. The mall has about four Japanese lunch spots. The Shiso Tree has a variety of hot dishes. You just have to point to what you want from the eight different steam trays at the front counter. For the adventurous the small Izakaya lunch spot nearby has contemporary Japanese munchies you can try cheaply. 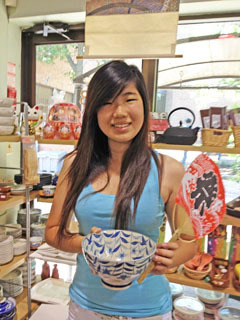 Every summer, J-Town hosts a monthly outdoor bazaar. Here you can find special cooked goodies, or useful, second-hand Japanese items at great prices. One year I found two old-style, highly decorated picnic bento boxes that hold enough rice and topping for two. They were $3.00 each. I’ve been going to this mall for over 10 years. Each time I go, however, I find many things have changed. 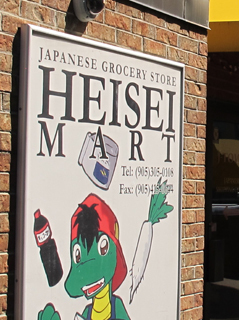 Although there is a good selection of Japanese groceries, some of my favourite items have now disappeared. The top of my list was home – made soft green tea ice cream cones and a wonderful black sesame ice cream. You couldn’t find these elsewhere. Alas the woman who made them has returned to Japan. J-Town is open: Tuesday to Friday 10 am-7 pm, Saturday 9 am-7 pm and Sunday 11 am-6 pm. Credit cards are accepted. Free parking and wheelchair accessible. For more information, please consult: http://www.jtown.ca/NewStuff/index-j.htm . Do they have a shop that sells plushies like Alpacasso? Does the bookstore sell English manga? I live in Toronto too! Do you know if in their japanese cosmestic stores sell Hado Labo products? Thank you! Sorry Karen, I don’t know about Hado Labo products. You’ll have to check the Web. Ruth. 2017 Update: The J-Town Summer Festival will be on July 22.